One of the biggest adjustments for me with this new cohabitation thing has been figuring out dinnertime. Suffice it to say that the food of my bachelorette days just doesn’t cut it when it comes to feeding a hungry guy (wait, you mean dudes aren’t down with scrambled eggs or a “big salad” and three bites of reheated lunch leftovers for dinner every night?!). So my new challenge in the kitchen is to come up with meals that are satisfying for the male half of the household but not too taxing after a day’s work*. That, and planning ahead enough to have certain ingredients on hand so as to minimize after-work errand-running that cuts into my cooking time. *I should note that said dude does cook for me every now and again and that my being the one to make dinner is more a control freak issue on my end than him “expecting” me to do it! That said, there’s a part of me that chafes at the thought of the fast-n-easy Rachel Ray-style school of cooking. I’d rather spend all Sunday in the kitchen making a huge pot of stew or something else we can reheat a couple times through the week. I’m fine with making the occasional quickie meal (pasta puttanesca or weeknight omelettes are favorites), but sometimes I want something a little snazzier; plus, someone complains if they feel too protein (ahem, *meat*)-deprived for too many days in a row. Having splurged recently on some nicer-than-usual wines at Western Market, I decided to try a recipe I’ve had my eye on for a while, a braised salmon in Pinot Noir from Molly Stevens’ excellent book All About Braising. Folks, I’ve sung the praises of this book and its recipes many times before, and if you haven’t yet picked it up I would highly recommend it! Although the recipe required some slicing, dicing and infusing, it was really easy and I was able to do the prep work while the side dishes (a Wehani rice and some Puy lentils) cooked. All in all I’d say the meal took a little over an hour, not too much effort considering the fantastic results. I wasn’t sure if my skillet handle was ovenproof so I decided to do the braise on the stovetop. The salmon came out a tiny bit on the dry side (my fault, not the recipe’s), but paired with the flavorful sauce, it was still very good eats. 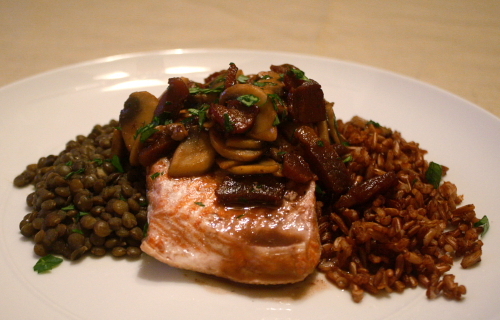 The red rice and lentils were the perfect earthy accompaniments to the mushroom and bacon-laced wine sauce. I was inspired a few nights later to pan-sear some venison tenderloin and make a similar pan sauce of shallots, mushrooms and wine. It’s a shame that Marvin wasn’t home to enjoy it with me; he was in NYC for his first gallery show (nice, right?) so I had the tenderloin all to myself. I would’ve waited to make the dish for us both, but due to a freezer debacle (cough*dontbuykenmore*cough) I was trying to use things up before they spoiled. I salted the meat, seared it in clarified butter to medium, then let it rest while I cooked shallots in the butter and deglazed it with red wine. The mushrooms were cooked in a separate pan while the meat was cooking, and added at the end. I ate it with the lentils and rice left over from the salmon dinner and it was nothing short of spectacular. Next year I’m begging my dad for more tenderloin! Also, I want to try one of these venison tenderloin recipes from Hank Shaw’s blog when I have the time/ inclination to get slightly fancier. I just want to leave you with this: If you’re cooking meat in a skillet and not making a pan sauce, it’s like leaving money on the table. Any crusty bits that remain contain so much flavor and it only takes minutes to create a sauce that will have you scraping your plate. I also like to make pan sauce from chicken drippings that remain after roasting a chicken in a cast iron skillet. Red or white wine can be used, just use whatever you’re drinking. For red meat, cognac or brandy can be used instead of wine; just boil the sauce enough to get rid of any harsh boozy flavor. If you salt your meat, you shouldn’t need to salt your sauce, but taste and see. A couple turns of black pepper is de rigeur as well. Notes: I scaled the recipe down to serve two, but this version serves four. If making for two, halve the salmon quantity and reduce the other ingredients by about 1/3. Examine the salmon to see if it contains any pinbones by running your finger down the center. If you feel any small bones, remove them with a tweezer or needle-nose pliers. Season the filets with salt and a little pepper and set aside. Brush any dirt from the mushrooms (I like to just peel them by gently pulling the outer layer off, just don’t wash them with water). Trim the bottoms of the mushrooms and separate the caps from the stems. Thinly slice the caps and set aside. Dice the stems and reserve separately from the caps. 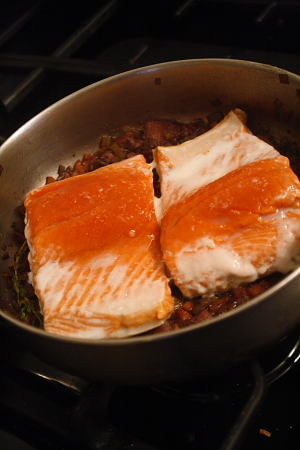 Prepare the braising liquid: Select a skillet just large enough to hold the salmon filets in a single layer (12-13 inches diameter). Add half the bacon to the cold skillet and cook over medium heat until it cooks through and renders much of its fat; do not allow to crisp. 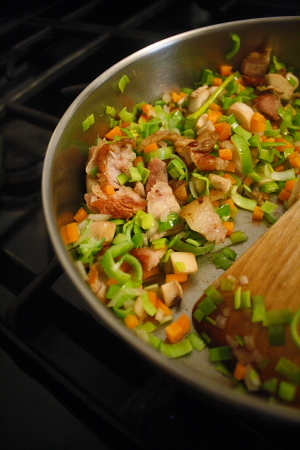 Increase the heat slightly, adding the leek, carrot, shallot and mushroom stems and sauté until the vegetables are soft and just beginning to brown. 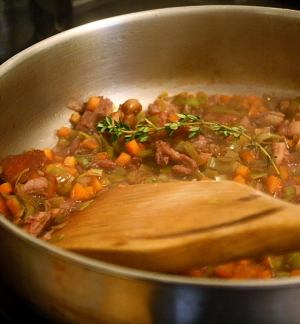 Add 1 cup of the wine and the thyme and bring to a rapid simmer until the wine is reduced by half, about 10 minutes. Add the remaining 1 cup wine and simmer an additional 5 minutes. While the sauce is cooking, fry the remaining bacon in a medium skillet until crisp; remove with a slotted spoon and place on paper towel to drain. Discard most of the bacon grease and add 1 Tbs butter, swirling off the heat to make sure it doesn’t burn. 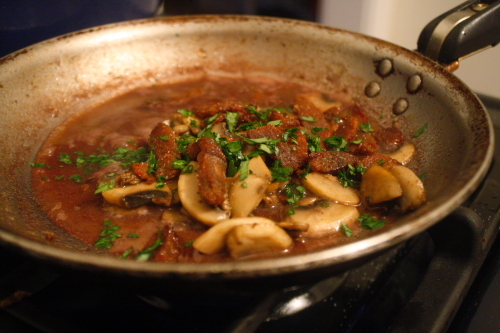 Add the mushrooms and sauté over medium high heat until the mushrooms have thrown off their liquid and become golden. Remove from pan and set aside. You will reuse this skillet to finish the sauce. so just leave it on the stove, no need to wash it. When the sauce base has cooked, add the salmon, skin side down. Cover tightly with foil and/or a lid, and place in the oven. After 15 minutes, check the salmon by discreetly slicing into the thickest part of a filet; if you see just a bare hint of dark pink, it’s done (it will continue cooking as it rests). Remove the salmon to a plate and cover with foil. Strain the sauce through a fine-mesh strainer into the medium skillet, pressing down with a spoon to obtain as much liquid as possible. Bring to a rapid simmer for 2 minutes and reduce to a gentle simmer, whisking in the remaining 1 Tbs butter.Add the reserved bacon and mushrooms and the parsley. Taste for salt and pepper, adding if needed. Plate the salmon and top it with the sauce; serve immediately. Once again I am doing my Daring Kitchen post at the last possible second… I was planning to make the sushi last weekend but got busy, blah blah. I’ve made sushi at home before, so I guess I thought it would be no big deal to go to the store at noon-ish and have the sushi made in time to be able to take daytime photos and post by this evening. Long story short, all the sushi got made, but it took over 3 hours and I didn’t even get to photograph the dragon roll. It’s just as well- I was rushing so much that it didn’t look like much of anything worth photographing. It tasted great though- I modified a favorite roll from our usual sushi joint, Noble Fish (a restaurant/Japanese grocery, where I got the supplies for the sushi). Sushi chefs have been doing California rolls since the ’80s; the chefs at Noble went even further south to Mexico for inspiration. The Acapulco roll is one we frequently order- an inside-out roll with tuna, avocado, jalapeno, and rolled in cilantro leaves. Noble Fish uses pickled jalapenos, but I opted for fresh, and added a little cucumber since I had some left over. I made the first Acapulco roll with the cilantro inside and the avocado on the outside (that was supposed to be my Dragon roll), but wasn’t that thrilled with how it turned out so I made the rest as “normal” sushi rolls. If I ever get a bug to make sushi again, I’ll be sure to take some nice beautiful shots of my Acapulco roll. However, I think the verdict may just be that sushi is one of those things best left to the pros. I saved a little money making it myself, but three hours is a long time for something that gets devoured in a few short minutes! If you’re thinking about making it yourself, though, I highly recommend the flavor combination of the Acapulco roll. Cilantro+sushi=yum.